Jason Willet, Jad Fair and the rest of the crew return with what is their most widely expressive and yet most "back to basics" album yet. "Widely expressive" in that they continue to take their music to places it has never been. Their exploration covers the gambit from arrangement to instrumentation to emotive vibes. "Back to basics" in that this album, maybe more than any I have heard from them, has its roots planted firmly in solid pop rock sensibilities. Each song is infectious and memorable yet is so in its own unique way. I suspect for many listeners "Hello" is going to be mysterious and for others it is going to be like having an old friend come to visit*familiar and exciting at the same time. 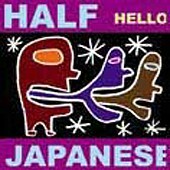 It seems to me that HALF JAPANESE have achieved that evolutionary step in pop music that psychedelic pop acts like JEFFERSON AIRPLANE achieved two generations ago.